Nothing from the book today, but something that chimed with my motivation for writing it. Our countries are much too large for all of us to get together and debate in person, so we have... media. Now, I'm not going to get into the thorny subject of media, be it MSM, facebookery or the twitterati, but it is worth pondering how Athens-style democracy scales up to a country of millions of people given that it grew out of what we would now regard as a small city or town. Our current system is representative democracy with party politics. We hold an election every 5 years or so, elect representatives, and the party (or parties) with a majority of representatives in parliament forms a government. The government gets all the power, so it's essentially winner takes all, even in Scotland where we have proportional representation. So an MSP represents about the same number of people that had the vote in ancient Athens (which was about a fifth of the population) and an MP has to represent double that. Humans struggle to "know" more than about a hundred people at any one time, and all of the above numbers are in the thousands. So our representative has a tough job of knowing the people he or she is supposed to represent. And, the flip side of this is that many feel unrepresented. The tribal aspect of the party political system can further exacerbate this feeling amongst those who did not support the winning candidate. One thing that I think can help is if local groups get together to discuss issues. But for this to be effective there must be some way for this to federate up to a level where an elected representative can meaningfully engage. At present, this process does occur to varying extents, but mainly through political parties, or movements associated with parties, e.g. trade unions or loose coalitions assembled for a referendum campaign. The hustings that occur in the run-up to elections might seem to fit this bill, but they're more concerned with questioning candidates than giving people the opportunity to discuss in open forum. So this is the media we need for democracy: uncensored, diverse and trustworthy. To achieve this all of us need to be active citizens like those ancient Athenians. We have to watch our media as carefully as they're watching us and when they get it wrong, speak up with a loud voice. He refers to the media in the last sentence but I think it's even more important to do the same with our government. We need to ensure that they did what they said they would do when we elected them, and if they did not, they should explain why without evading our questions. OK, I'm at risk of getting a bit po-faced, so here's a reminder of the fun that ensues when a government-funded body attempts to mix democracy with public relations. Economies of different countries are connected by trade. A country aiming for complete economic independence, such as North Korea, is called an autarky and is moving very much against the tide of globalisation. As we'll see below, Scotland's economy is deeply connected via trade to other countries. Importing gives a country access to goods and services it cannot produce itself, or perhaps at lower prices than domestic costs allow. Too much importing may harm a country's businesses however, especially if they struggle to compete on price. Exporting gives a country access to a larger pool of customers. A rise in exports is generally viewed as a good thing for an economy as it can encourage growth of the country's GDP. But again, too much exporting can have a downside in that it may disrupt the economies of the importing countries, and the exporting country will be vulnerable to any disruptions in those economies. This graph shows imports and exports as a fraction of onshore GDP from the 2015Q3 edition of Scotland's national accounts. Exports are shown as positive numbers and imports as negatives. This reflects the fact that exports involve a flow of money into Scotland, and imports are a flow out. Scotland is a net importer with the rest of the UK in that more is imported than is exported. The situation is reversed for the rest of the world for which Scotland is a net exporter. Overall, because most trade is with the rest of the UK, Scotland is a net importer. This can most easily be seen in that Net Trade (total exports plus imports) is negative in every year. More detail on exports are given in the Export Statistics Scotland report 2014 that was published in January 2016 by the Scottish Government. Its figures are calculated on a slightly different basis from those in the national accounts and as such are generally larger, though they show similar trends over time. 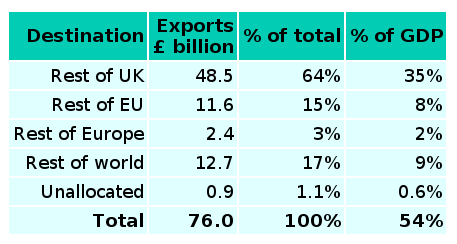 This table shows the breakdown of Scottish exports by destination in 2014. Most exports — almost two-thirds — are to the rest of the UK. Most of the remainder is split equally between Europe and the rest of the world. And just over half of Scotland's economy, some 54% of GDP, depends on goods and services from Scotland being bought by customers in other countries. With such a deep connection to other economies through trade, Scotland's economy depends on the health of other economies. If, for example, the rest of the UK and Europe experience a recession, then Scottish exports would suffer and Scotland's economy could well enter recession too. Much the same is true of the UK economy within Europe. The exchange rates of currencies affect trade. For example, if the pound went from €1.20 to €1.80 then goods sold from the UK would become 50% more expensive to countries using the euro. This may increase export income in the short term but in time importers can switch to cheaper non-UK suppliers, reducing exports which will hinder the UK economy. The essential point in all of this is that the economy and currencies of countries engaged in trade are mutually dependent. The larger economies will be able to wield more power and exert more control over their currency, especially if they are net exporters. This is currently the case with Germany in Europe and has become a problem in the wake of the 2008 financial crisis because there is monetary union but no political or fiscal (tax and spend) union. If the euro (and EU) survives then such problems could be eased by strengthening democratic control of the EU so that less power is held by the wealthiest countries. I've repeatedly been qualifying statements with "excluding North Sea activity" in past posts, now I'll explain why. The D in GDP stands for domestic and it refers to the fact that it only includes economic activity located inside the country of interest. According to the EU's standards on national accounts — called ESA10 — this means that North Sea oil and gas activity should be placed in a region of its own outside any of the UK's individual countries. This is why Scotland's "official" GDP includes only onshore economic activity and excludes that taking place in the North Sea. However, for some purposes it is of interest to include the North Sea in Scotland's total GDP, most obviously to consider how Scotland's economy might look if it were separate from the UK. The most common way to assign a share of North Sea GDP to Scotland is on a geographical basis according to the number and size of oil and gas fields that are under the sea bed off the coast of Scotland. This varies depending on how active various fields are in a given year. In 2014-15, the geographic share assigned to Scotland was 80% whereas Scotland's population as a fraction of the UK was 8.3%. 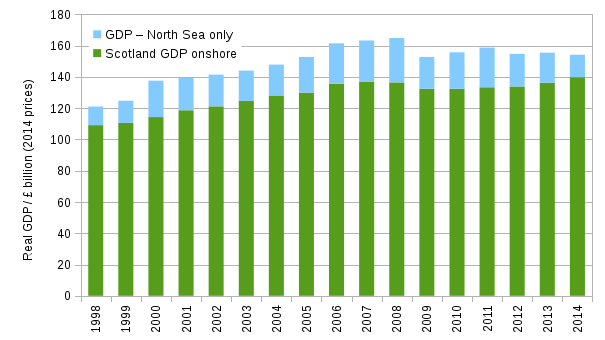 This graph shows Scotland's geographic North Sea share in addition to Scotland's onshore GDP. The data is taken from the 2015Q3 edition of Scotland's national accounts that was published in February 2016. The share of North Sea GDP as a percentage of onshore GDP was 9.8% in 1998, and then grew to peak at 17.2% in 2008, but fell to a low of 9.3% in 2014. The growth rate of GDP, often referred to as just 'growth', is more often discussed than GDP itself. It's the percentage change of GDP from one year to the next. For example, the onshore growth rate for 2014 is 139.8 - 136.3 divided by 136.3 which gives 0.026 or 2.6%. The graph below shows growth rates with and without the North Sea, along with the UK growth rate for GDP (which includes all North Sea GDP). The most striking feature is that the line for Scotland including the North Sea has large spikes, with growth exceeding 10% in 2000 and falling to below -7% in 2009 (part of this is due to the recession of course). This volatility of North Sea GDP is caused by the oil price. Its effect on UK GDP is barely noticeable because North Sea GDP is a much smaller fraction of its total (1% for the UK compared to about 10% for Scotland). All growth rates clearly show the recession following the 2008 financial crisis. A recession is defined as a period in which two or more consecutive quarters (3 month periods) show negative growth. It's common to say that the economy contracted or shrank because GDP falls in a recession. Scotland's onshore growth appears to be more variable than that of the UK. This may be because North Sea economic activity has an influence on onshore activity, or because the much larger size of the UK's economy reduces the relative size of statistical fluctuations in GDP. 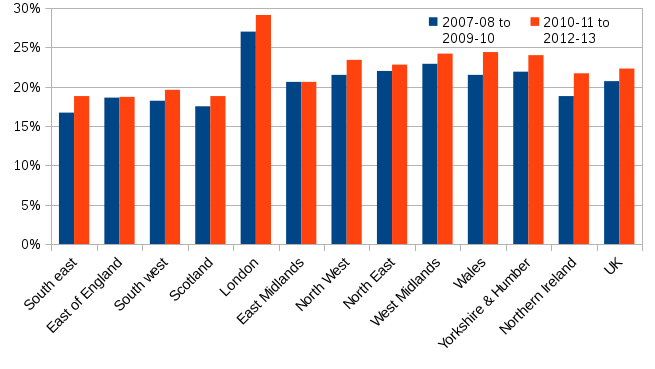 Prior to 2009, Scotland's onshore growth was comparable to the UK's. The average for 1998-2007 was 2.6% for Scotland and 2.9% for the UK. However, since 2009, Scotland's average was 1.1% and the UK's 1.9%. Both Scotland and the UK had similar growth in 2013 and 2014. Scotland's growth including the North Sea shows a very different picture post-2009, with GDP shrinking in 2012 and 2014 and barely growing at all in 2013. If this was official GDP then Scotland would've been in recession for much of 2012-2014. The quarterly accounts for the end of 2015 are not out as yet, but the first figures for GDP in 2015 show that Scotland's onshore growth for 2015 is likely to be smaller than for 2014, and smaller also than the whole UK's growth in 2015. In fact, in the third quarter of 2015 growth was -0.1%, meaning that Scotland's economy shrank. It's likely that the slow down of the North Sea industry is now hindering the onshore economy via its effect on businesses such as technical consultancies and hotels and restaurants in Aberdeen. As the North Sea example shows, it's unwise to consider one part of an economy in isolation. So to understand Scotland's economy you need to consider how it's linked to the UK, the EU and the rest of the world. The next post will look at Scotland's imports and exports. This post was going to be on GDP and the North Sea, but some comments I made about GDP and household income in the previous post turned out to be more topical than I expected, so the North Sea will have to wait until tomorrow. Today the treasury published a document on how Brexit might affect the UK economy. In the foreword, Chancellor George Osborne writes "families would be £4,300 worse off" and this figure has been widely repeated in various traditional and online media. For the sake of argument, let's take the result at face value and consider what a £4300 drop in GDP per household might mean in Scotland. Scotland's GDP for 2014 was £140 billion (excluding North Sea activity) and there are 2.42 million Scottish households. This means Scotland's GDP per household was £57,800 in 2014. So a drop of £4300 would be 7% in percentage terms. This is comparable to the drop in incomes caused by the 2008 financial crisis, as described in this post. 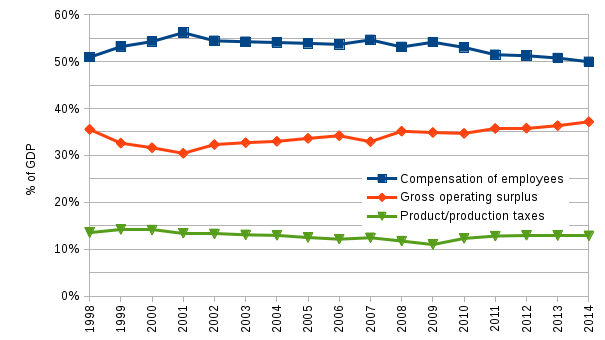 This shows us that about half of GDP goes to "compensation of employees" (which has been slowly declining since 2001, but that's a story for another time). So if half of GDP goes towards paying employees, then it seems reasonable to suppose that the drop in an average household's income will be half of the £4300, ie £2150. Job done? Not quite, we also need to think about what happens to the rest of GDP. About 10-15% of GDP goes on taxes on production and products, which is mostly VAT, and this goes to the government, not households. The remainder of GDP goes to "Gross operating surplus", and to explain that, allow me to digress for a moment. In my younger days, I was the treasurer of a student astronomy society. When it came time to do the accounts, I noticed that my predecessors had entered surprisingly large amounts for "biscuits" in previous years. After asking why, it turned out it was a balancing item, ie if the accounts wouldn't add up, then the biscuits amount would be adjusted accordingly. In national accounts, the gross operating surplus is a bit like "biscuits", in that it's often used as a balancing item and so it's hard to say in detail how it breaks down. But a lot of it will be various operating costs of business and also their profits. So what? If half the drop in GDP is spread across VAT, operating costs and profits, that's not going to affect household income, is it? Not directly, but it's still worth considering what effect it might have. If you receive dividends from shares, then that contributes to household income in addition to your salary. So if a drop in GDP causes a drop in profits that will reduce dividends and some household income. But, admittedly, for most households, this will be a very small part of income. However, if you have a private pension, then the contributions you pay into it are used to purchase shares, and part of the growth of the pension fund will be from dividends. So it's quite likely that a drop in GDP will, via the drop in company profits, reduce your household income in retirement. Private pension wealth is in fact the largest kind of wealth, as mentioned in a previous post. But we're still not finished. VAT isn't the only tax going to government: income tax, national insurance and council tax come from household income, and corporation tax comes from company profits. According to the national accounts, Scotland's total revenues (again excluding the North Sea) are £51 billion for 2014, so if it drops in line with GDP this may fall to £48 billion. For comparison, Scotland's total public expenditure is £68 billion. And this leads to the most important point, that a drop in GDP will mean lower public revenues and this could, depending on the government of the day, lead to cuts in public services. This includes benefits, which make up a significant portion of income to the poorest households, and also state pensions. So, in summary, although the fall in household incomes will be nowhere near £4300, the reduction in GDP is likely to reduce pensions in the future and cause a fall in public revenue which could lead to spending cuts that hit low income households the hardest. This is of course all dependent on whether the prediction of the £4300 figure is believable, but I'll leave that for others to assess. 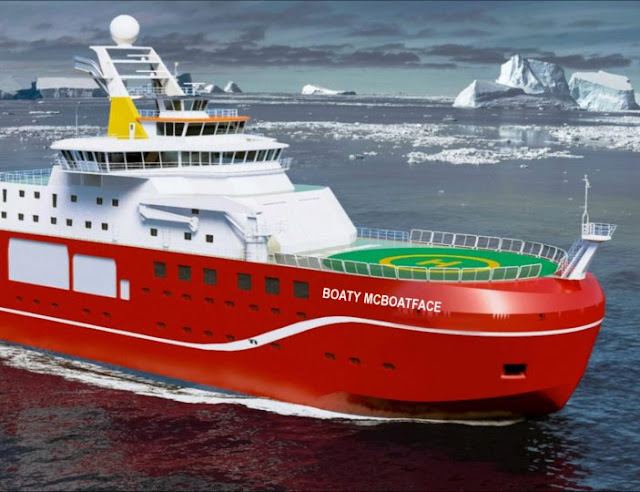 In the next post, I'll turn my attention to how the North Sea is treated in the UK and Scotland's GDP figures, and I'll explain why I've been excluding the GDP figures so far. GDP — what on earth is it? GDP is mentioned regularly in the media and in political discussion, but it's very rare that I've heard a good, accessible description of it. For this reason I spent quite a bit of time honing an explanation of it in chapter 6 of the book. This post gives a more concise version. Gross Domestic Product (GDP) is the most commonly discussed measurement of economic activity. It is the total of all value created in an economy. A business, whether it is sole-trader or a large multi-national manufacturer, creates and adds value. Consider a furniture business that takes wood and turns it into tables and chairs. It buys bits of a wood, does work on shaping and joining them and sells the finished product. The difference between the cost of the wood and the final sale price is a measure of the value added by the business. product because it concerns production. domestic because it only includes production inside Scotland. gross because an element of depreciation has not been deducted (e.g. wear and tear on the business's tools and machines). The official GDP of Scotland in 2014 was £140 billion. (This excludes North Sea industry, which I'll come back to later.) In other words, all economic activity in Scotland resulted in £140 billion of value being created in making physical products, like tables and chairs, or delivering services, such as legal advice or IT support. An increase in economic activity — for example, an increase in the number of tables being made and sold — can cause GDP to rise. But GDP can also rise because of inflation without any increase in economic activity. GDP that is not corrected for inflation is called nominal (or is said to be current prices or cash terms) and GDP that is corrected for inflation is called real. It is real in the sense that it measures actual economic activity. This graph shows the real GDP of Scotland (excluding North Sea activity) from the Quarterly National Accounts of Scotland 2015Q3 edition, published in February 2016. From 1998 to 2007, GDP grew steadily, but following the financial crisis of 2008 it fell and has since recovered. If this pattern seems vaguely familiar, it might be because the graph of real incomes in an earlier post shows a similar time profile. This is not a coincidence. If GDP grows faster than the population then some of the extra value added in the economy can go towards raising people's incomes. And that leads to an interesting point: one person's spending is another's income. In fact, an alternative way to define GDP, and to compute it, is the income approach. In this you look at the income of individuals from doing work (i.e. labour), the income of businesses (akin to profits) and the income of government (tax). If you add all of these up you will also get an estimate of GDP. But a GDP of £140 billion for the country is still a remote and abstract figure. To bring home its meaning, we can divide it by the population to obtain the GDP per person (also called per capita) which is £26,100. I won't dive into further detail of it here, but it's again no coincidence that this figure is roughly comparable with household incomes and employee earnings. In the next post I'll take a look at Scotland's GDP with North Sea activity included and discuss growth rates. This is the last in this series of posts on inequality. I've left debt to last not because it's not important, but because it is a tricky topic shrouded by a fog of misconceptions. "Is sugar bad you for you?" I asked my Dad when I was a small boy. "No. Too much sugar is bad for you." "And carrots are good for you?" "Not if you eat too many of them." So I was getting a premature lesson in semantics, but the relevance is that a similar point can be made about debt and wealth. Debt isn't necessarily bad: a loan can fund a new business, and a mortgage can allow a family to fund a good home. It's too much debt (and wealth) held unproductively that creates a problem. Private pension wealth is that in occupational pension schemes with employee contributions. Property wealth is the value of property less debt secured on property, typically mortgages. Physical wealth is the value of cars, household goods, electronic devices, jewelry and other material possessions. Financial wealth is the total of financial assets less the value of non-property related debt. Notice that financial wealth and property wealth are defined as assets less debts. If debts are larger than assets then there will be an overall net debt. For a property where the mortgage is larger than its value this is often called negative equity. Data in this post is taken from the Wealth and Assets Survey in Scotland which provides figures on all four types of wealth. Financial wealth shows the greatest inequality, as can be seen in this graph which plots household wealth held by each decile (see this post for a quick introduction to the idea of deciles). The first and second deciles have negative financial wealth — debts exceed assets. The net debt of the first decile is £3.3 billion, which equates to about £6200 per individual in that decile, and is similar to the net wealth of the seventh decile. Remember that the graph shows net financial wealth, so even though the values are positive for the higher deciles this does not mean households in the upper deciles do not hold any debt. In fact, they have more debt than the lower deciles. The Wealth and Assets survey states that the median amount (half had less, half had more) of non-mortgage debt outstanding for all Scotland's households is £3500, whereas it is only £1200 for the least wealthy 30%. Although this may seem surprising at first sight, there's a ready explanation: those with more wealth are able to borrow more. This graph shows the median amounts of outstanding non-mortgage debt for the least wealthy 30% of households. Student loans show the highest levels of debt and is the only type of debt to show consistent growth over the entire 6 years. 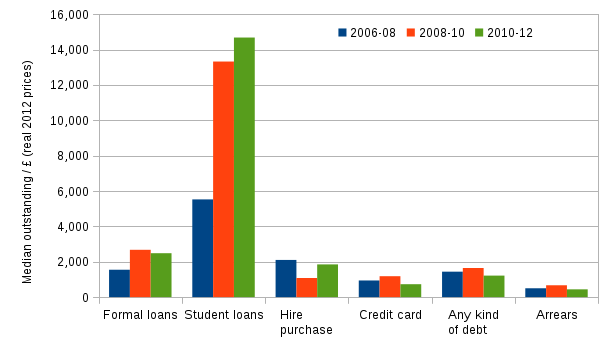 In 2006-08, the median for student loans in the poorest 30% of households was £5500. 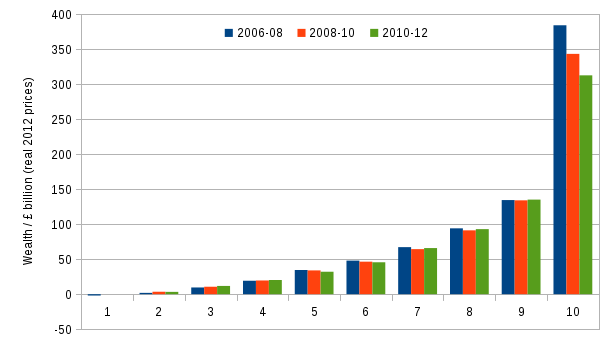 By 2010-12, this had more than doubled to £14,700. Student loans are owed to the Scottish Government and it is a remarkable fact that they have now become the Scottish Government's largest financial asset. The student loans example provides a striking illustration of the fact that one person's debt is another's asset. When you realise that debt and wealth are two sides of the same coin, then some realities of the economy, money and society become clearer. Specifically, if there exists bad debt then there will exist an equal amount of bad wealth. If you look back to the graph in the previous post, the pronounced fall in wealth in the tenth decile can be thought of as bad wealth disappearing. A bad debt is one which cannot be paid back. The years leading up to 2008 saw a rapid increase of private debt which ended in crisis when it suddenly became clear how much of it was bad, particularly mortgages. Governments bailed out banks and private debt was effectively transformed into public debt, but that was not enough to avert a recession. And because the fundamental issues that gave rise to so much bad debt were not resolved, the recovery was, and still is very weak. The build up of private debt prior to 2008 did lead some non-mainstream economists, notably Steve Keen, to warn that a financial crisis was looming. If his reasoning is correct — and there are still many economists unconvinced, and politicians uninterested — then we can expect the rapid rises in private debt in a few countries to cause crises in coming years, namely, China/Hong Kong, Australia, Sweden, Korea, Canada, and Norway. As I'm a scientist by training, I welcome theories that make clear, testable predictions and so I'll watch what happens in these countries with interest. As I'm also a human being who does not like to see economic collapse and the misery it can bring, I'm hoping that governments will weigh the evidence and act accordingly. Inequality of income and wealth are often blurred in popular discussion. For example, when you hear someone refer to "the 1%", are they meaning in wealth, or in income? Does it even matter? I'd argue yes for two reasons. The first is demonstrated in the graph below, and I'll explain the other reason at the end. The Wealth and Assets Survey in Scotland was published in March 2015 and provided data on wealth of households between 2006 and 2012. This data is drawn from the GB-wide Wealth and Asset survey analysed by the Office for National Statistics (ONS). The data is split into three two-year periods: July 2006 to June 2008; July 2008 to June 2010; and July 2010 to June 2012. The figures I'll present are adjusted for inflation to be in 2012 prices. 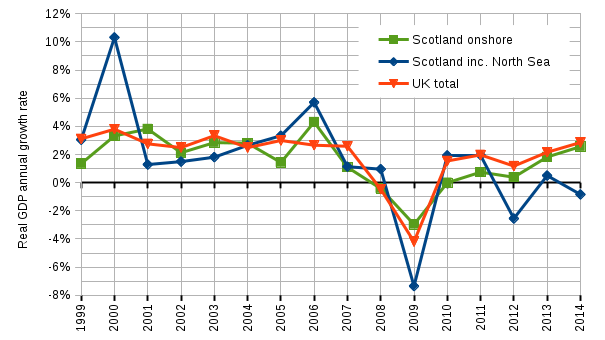 Total household wealth in Scotland has fallen by 6% in real terms between 2006-08 and 2010-12. Most of the fall is caused by wealth held in the form of property which fell by 12%. The total wealth for Great Britain (UK except Northern Ireland) in 2010-12 was estimated at £9500 billion, of which £714 billion is in Scotland. This is 7.5% of the GB total, and is lower than Scotland's 8.6% population share. The graph below shows the household wealth owned by the ten deciles for each two-year period. Each decile represents 10% of the population (about 530,000 people). The inequality in wealth is clear: the first decile owns near zero wealth whereas the tenth decile owns just under half of all wealth and two to three times that owned by decile 9. Wealth inequality for the whole of GB shows a similar pattern. Household wealth shows much greater inequality than household income. For income in 2011-12, shown in a graph in an earlier post, the top 30% received 51% of the total, and the bottom 30% received 14%. For wealth shown in the above graph for 2010-12, the top 30% (deciles 8 to 10) own 75% of the wealth, and the bottom 30% (deciles 1 to 3) about 2%. It's important to realise that the deciles for wealth and income are distinct. For example, it is not the case that the 10% of the population in the top decile for income are also in the top decile for wealth. A pensioner living in a home for which the mortgage is paid off may be in a high decile for wealth, but a lower decile for income. The only decile to experience a significant drop in wealth — a 19% fall — over the six years is decile 10. This is plausible because the richest in society hold much of their wealth as assets such as shares and property and these saw significant falls because of the financial crisis. The first reason why it is important to distinguish between income and wealth inequality should be clear: inequality is much larger for wealth. And the second reason is involved in the first — tax. Income, that is money paid in return for some form of work, is taxed progressively, in that the percentage paid as tax increases as income increases. Wealth on the other hand is hardly taxed at all. By my estimates, about 40% of Scotland's revenue comes from income tax and national insurance, whereas no more than 4% comes from taxes on wealth. Ramping up income tax on the top 1% of high earners could reduce income inequality, but it'd have next to no impact on wealth inequality because the top 1% for wealth can, quite legally, benefit from returns on their wealth outside the income tax system. Part of the reason for this is because the very wealthy can optimise their tax across countries, but it's also because the wealthy do not receive most of their income from doing work, but as returns on existing wealth. For this reason Thomas Piketty and others have proposed a wealth tax at the EU or global level at seemingly modest rates of 1% to 3% per year. A side effect of taxing wealth in this way is that we'd have much better data on it. Wealth data is much more uncertain than that for income, especially for the most wealthy, and part of the reason for this is that countries need to monitor income to check taxes and decide who should receive benefits. The implication of this lack of knowledge on wealth is that graphs like the one above underestimate wealth inequality. There's one way to confirm the problem: every debt is someone else's asset, and so at the global level the two must equal. If we add up all known debts in the world, it exceeds corresponding world-wide wealth; a conundrum that Piketty refers to as the Earth being in debt to Mars. These rich Martians are likely to have stashed their wealth in tax havens. The next post will be the last in this week's series on inequality in Scotland, and it will look at debt which, if you squint carefully at the graph above, is just visible for the first decile. During the referendum campaign in 2014, I remember being told by folk arguing for independence that Scotland's problems of poverty and income inequality couldn't be fixed from inside the UK. Then in the general election of 2015, and in the current campaigning for the 2016 Holyrood elections, I've heard pro-union politicians directing blame for failure to act on these issues at the current Scottish Government. In writing the book, I was keen to learn who was closer to the truth, but what I found was a complete surprise. The graph below shows data from the Institute of Fiscal Studies on absolute poverty rates after housing costs (see previous post on poverty) for all UK countries and regions. Scotland has the joint lowest poverty rate along with the South East and East of England. Notice that London has by far the highest poverty rate of any region — this is mostly due to its high cost of housing. As we saw in the last post, Scotland's poverty has risen in recent years and we can now see that this is true for most of the UK. Next, let's take a look at incomes using data from the Office of National Statistics UK Labour Market bulletins. Unlike other data in this series of posts, these are incomes from employment (i.e. benefits aren't included) before tax is deducted. This means we can compare values within this graph, but not with graphs in previous posts. 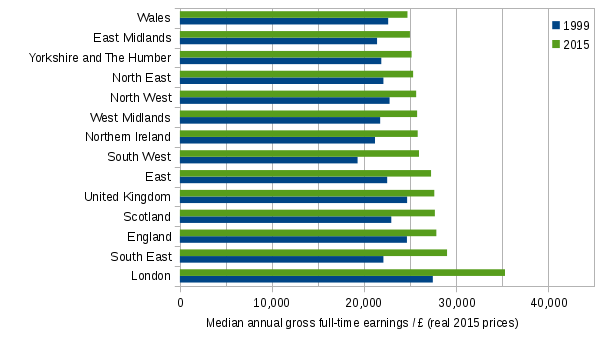 Scotland's median income is similar to England's and ranks as one of the highest, only exceeded by the South East's and London's. Also, Scotland's rise in real terms in the last two decades, which was also seen in a previous graph, is significantly larger than England's or the whole UK's. Critics of the UK that suggest Scotland is kept poorer by being part of it, and also those critical of the current Scottish Government's stewardship of the country, may want to revise some of their rhetoric. Then again, who am I to suggest that facts should get in the way of a good political fight? EDIT 14/4/16: This post's aim was simple enough: use numbers to place Scotland's income and poverty situation in a UK context. But, as mentioned in the last post, I think it's important to consider aspects that cannot be measured with numbers, and look beyond any one country. Just after I hit publish on this post, I noticed that UNICEF have done just that — their report puts the UK situation in a wider context. If there is one thing no politician should ever do, it is to allow the poor to become poorer. The graph in the last post showed that people of all incomes have experienced real terms rises over the last twenty years. In this post I'll look at standard measures of poverty and how they tell a slightly different story. There are two main measures used to track poverty in Scotland and throughout the UK and both are based on income. One is called relative poverty and the other is absolute poverty. In both cases, an individual is deemed to be in poverty if their household income is below a certain amount, often referred to as the threshold. The relative poverty threshold is set relative to the rest of the population that year, and so it can change every year. In contrast, absolute poverty is defined using a threshold that does not change each year, but is revised every five years or so. It may help to draw an analogy. Imagine ten competitors in a race on a running track. You could define a slow runner as one who finishes in eighth, ninth or tenth place. This is like relative poverty. However, you could instead define it as being anyone who took longer than the time taken by the person who came seventh in last year's race. This is like absolute poverty. The precise definitions are as follows. In 2013-14, the BHC threshold for relative poverty was £14,200 and for absolute poverty it was £14,600. The AHC thresholds were £12,100 and £12,600 respectively. Poverty rates are usually stated as a percentage of the population that are below the relevant threshold. This graph uses data from the Scottish Government to show how these poverty rates have changed over the last twenty years. The absolute poverty percentage halves in the first ten years. This is telling us people were moving out of poverty because incomes increased faster than inflation. Relative poverty shows a more gradual drop over the two decades, which tells us that people on lower incomes were moving closer to the median, which suggests income inequality reduced slightly. This is consistent with what we saw with the decile boundaries in the last post. 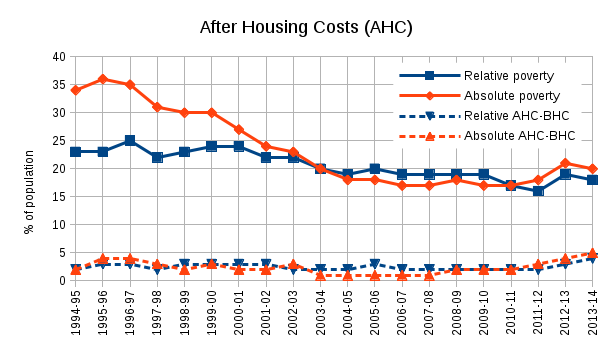 The dashed lines show the AHC poverty rate less the BHC one. AHC poverty is consistently one to five percentage points (pp) higher than BHC poverty. The gap for absolute poverty was only 1pp for most of the 2000s, but has widened since 2011-12 to reach 5pp in 2013-14. This tells us that housing costs have become a more significant factor for poverty in recent years. So, in summary, poverty rates reduced until 2006-07, remained constant for several years but have increased slightly in recent years due to housing costs. There are several aspects of these measures that I find unsatisfactory, but the most troubling one is that absolute poverty is a misnomer; it's just a variant of relative poverty that accounts for inflation. A condition characterised by severe deprivation of basic human needs, including food, safe drinking water, sanitation facilities, health, shelter, education and information. It depends not only on income but also on access to services. This doesn't involve numbers and, unlike the definitions above, refers to vital services such as education, health and provision of clean drinking water. These services are available to everyone in Scotland irrespective of income and this kind of poverty is all but consigned to history. Sadly, this is not true true for the whole world. There is a threshold of $1.90 per day that is often associated with the UN definition and people with incomes below it are often said to be in extreme poverty (there's also an unrelated Scottish definition of the same name). The good news is that extreme poverty is declining worldwide. I recommend watching Don't Panic by Hans Rosling of Gapminder if you'd like to know more. In the next post I'll compare levels of income and poverty in Scotland with other countries and regions of the UK. Inequality — we're all geting richer? In the last post I looked at a graph of shares of income in Scotland that showed inequality has hardly changed in the last 15 years. To answer the last question I posed at the end of that post, I'll now look at a better way to assess how the distribution of income changes. The median income divides the population into two halves: half earn more than the median and half earn less. But we can further divide the population into ten groups called deciles. 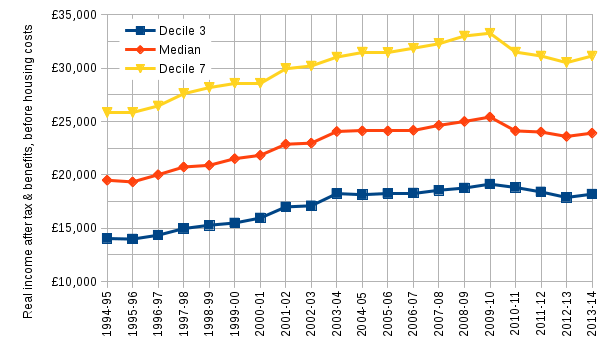 The 10% of the population with the lowest incomes are in decile 1, the next 10% are in decile 2 and so on until decile 10 which contains the 10% of the population with the highest incomes. The population of Scotland is currently about 5.3 million and so there are about 530,000 people in each decile. Just like the median is the boundary that divides the population into two groups, we can talk of decile boundaries So, rather than look at shares of income of the bottom, middle and top groups as we did in the last post, we can look at the decile boundaries. The upper boundaries for 3 and 7 are shown in the graph below along with the median (decile 5). Incomes are adjusted for inflation to be in real terms in 2013-14 prices as published by the Scottish Government. Everyone's annual income over the last two decades has risen by £4000 to £5000. To be clear, this data is corrected for inflation. In other words, a typical household in any decile in 2013-14 had over £4000 extra in income compared to one in 1994-95 — an income growth of over 20%. At the 3rd decile boundary, there was a 30% growth in income, and a 21% growth at the 7th decile boundary. So although higher income groups did experience a larger rise than lower income groups in absolute terms (£5300 against £4200), the lower incomes benefited the most in percentage terms (30% against 21%). So depending on how you choose to measure inequality you can claim that inequality both increased and decreased slightly. It's worth looking at the effect of the recession since 2008. Incomes peaked in 2009-10 and fell the following year, though the fall for the 3rd decile was the smallest in both absolute and percentage terms. The fall continued in all groups until 2013-14 which shows a slight rise. The fall at the 3rd decile was 5% and 6% at the 7th decile and it's clear from the graph the fall was also greatest in absolute terms for the 7th decile. The reason that the recession reduced higher incomes the most is because a good proportion of income in the first three deciles is from state benefits and these are not directly affected by the recession, unlike wages from employment. People on higher incomes tend to save more than those on lower incomes, and those on the lowest incomes are likely to save very little or be in overall debt. As such, a fall in income may have a substantial impact on the standard of living afforded by people in the bottom deciles, whereas it might have no effect on people in upper deciles other than reducing the rate at which they save. Is it true that we all got richer? No graph surprised me more than the one above when I was researching material for the book. There are number of reasons why it is surprising. Our intuition fails in appreciating the effect of slow growth over long time periods. An annual growth rate of 1% may seem fairly modest, but over 20 years this would lead to an increase of almost 22% (1.01 raised to the power 20) and so comparable with what we have just seen in the above graph. In fact, economic growth in GDP has exceeded 1% per year, but not all gains in GDP go to household income and also the number of households has grown too. The psychology associated with gains and losses is complex. On the one hand, people tend to judge how they are faring against their peers. This means that the steady rise in incomes was probably under-appreciated because almost everyone benefited from it. Also, people tend to feel greater displeasure at a loss than they would feel pleasure from an equal gain. For this reason, and because it was more rapid, the post-2008 income drop was felt more acutely than the overall gain in real incomes over the last twenty years. Another reason that it's surprising is that popular discourse about inequality often fails to distinguish between inequality in income and wealth and inequality in the latter is much greater, as I'll discuss in a future post. The next post will focus on how we measure poverty and despite what we've found above, there is good reason to believe it has started rising in recent years. The theme of the current series of posts is inequality. In the last one I looked at gender inequality and in this one I'll look at inequality in shares of income. Mention inequality and many people immediately think of the wealthiest 1%. There are good reasons for focusing on the very wealthy as with such wealth comes power to influence or subvert democratic institutions. However, there are less noble reasons for zooming in on extremes of wealth (and poverty) — it makes for better headlines and dramatic statements. I'd like to take a different approach and look at the majority of the population rather than exceptional minorities. Let's divide the population into three broad groups by income: the bottom 30% (deciles 1-3), the middle 40% (deciles 4-7) and the top 30% (deciles 8-10). Incomes are after tax is deducted and benefits are added. The graph below uses data from the Scottish Government and shows the shares of income going to each group in Scotland. The most striking feature of this graph is that the shares of income have hardly changed over fifteen years and this is despite the changes in governments in both the UK and Scotland. There is an increase in inequality leading up to the 2008 financial crisis, and then a reduction in 2010-11, but only by a few percentage points. It turns out that this kind of measure of inequality is quite insensitive to changes, and that this can be shown mathematically. On the up side, this lack of variation means we can summarise the last fifteen years succinctly: the richest 30% in terms of income received just over 50% of all income and the poorest 30% received 15%, and so 35% of total income went to the middle 40%. is it acceptable that the top 30%'s income is more than three times that of the bottom 30%? what standard of life is experienced by the bottom 30%? Or, to be blunt, are they poor? how does wealth inequality differ from income inequality? how do income, wealth and poverty differ between Scotland and the rest of the UK? are there measures of inequality that show changes more clearly? In upcoming posts I'll provide some answers to these questions, except the first one. That question is a moral and inescapably subjective one. Nevertheless, society must answer it and, in a sense, you can view our current tax and benefits system as the existing answer. But is it one you agree with? In some respects equality has improved, with leadership of Scottish political parties being an obvious positive example. Yet in many other aspects of life gender inequality persists, particularly in employment and pay. The gender pay gap refers to the fact that on average men earn more than women. 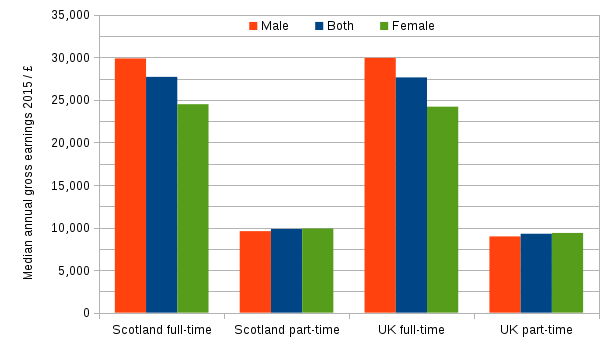 This graph constructed from ONS data shows the gap for Scotland and the whole UK for full-time and part-time employees. It is for gross earnings, that is those before tax. The gap is a little over £5000 and is slightly larger for the UK than for Scotland. The gap for part-time work is interesting because it reverses, in that women earn a little bit more than men. What's not shown on the graph is that about 60% of full-time jobs are done by men but only about 20% of part-time jobs, with the UK and Scotland differing by only a few percentage points. A possible explanation of the reversal of the gender gap is that more women than men, especially those in better paid jobs, choose to return to work part-time after having a family. But there's an interesting twist. The measure of average used here is the median: half earn more than the median and half earn less. For example, half of all males in full-time employment in Scotland earn more than £30,000 and half earn less, and so £30,000 is the median. The more common measure of average is the mean (so common it is often taken as being synonymous). To calculate the mean, you add up all the earnings and divide by the number of people. The problem with the mean is that a very small number of very high earners can cause the mean to be misleadingly high. For example, the median of 1, 10 and 88 is 10 but the mean is 33 (1+10+88 divided by 3). The graph below shows the gender gap in medians, calculated from the data in the last graph, and also the gap in means. For Scotland, the means tell the same story as the medians: men earn more than women full-time but there's a reversal for part-time. For UK full-time work, the mean also shows a gender pay gap in favour of men. And, here's the twist: there is no reversal of the gender gap for UK part-time work. The mean for men in part-time work in the UK is larger than that for women whereas the medians show the opposite. This suggests that a small number of men in part-time employment have very high earnings. What the data does not offer is an explanation of why. Answers on a postcard please, or in comments. 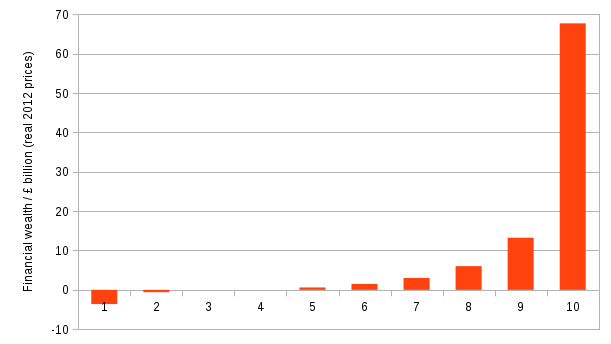 This graph and all the numbers stated in previous posts are, as far as I know, correct. The problems lie in the interpretation and how various facts are connected together, or omitted from the arguments. Curiously, both posts use the same trend in the graph to support their cause. The growth of onshore revenue gives hope that Scotland's deficit can be closed in future years for a supporter of independence, but also plays a part in highlighting that North Sea revenue is not a bonus in the pro-union argument. The claims that £15 billion is the smallest deficit excluding North Sea revenue and that the "eye-watering" £22 billion deficit of 2009-10 is the largest are mostly due to the difference in onshore revenue rather than spending. The question concerning raising revenues to match spending is not an if, but a how. The most problematic issue with the pro-independence argument is that it never explains "how" growth can be high enough to close the deficit gap in five or six years. According to the IFS a real growth rate of at least 4.5% would need to be sustained for that to happen and the argument does not mention which fiscal levers will be used to promote such growth. No one, certainly no credible economist, can tell us how a developed economy can reliably achieve such growth. Ireland's high growth rate seems encouraging, but it's unlikely to be sustained because it is mainly attributable to post-recession bounce-back and a weak euro helping to boost Irish exports. Also, it's important to remember that Ireland, being in the Eurozone, was compelled to go through heavy austerity in the wake of the 2008 financial crisis. In contrast, the graph above shows that spending in Scotland did not fall post-2008 but remained flat in real terms whilst the UK coalition government was in power. Even if we were to accept that Ireland's growth rate could be sustained, it is the only example of a developed country with such a high rate. This highlights that the argument plays the rhetorical trick of referring to critics who say it "cannot be achieved" and then demolishes the over-assertion with a counter example that is exceptional. If you wish for Scotland to be independent then an economic argument based on rapid growth is unlikely to convince others. There are of course more realistic proposals, such as this one which highlights how Scotland can make different spending choices if outside the UK. The pro-union argument's flaw is that it never explains why the UK is "well equipped" compared to an independent Scotland. Worse still, this quote undermines a key argument as to why the UK is well equipped by making a seemingly plausible but demonstrably false statement about the debt, deficit and interest. When I say "demonstrably", I mean from the historical record. Before reading further look at these three graphs. Firstly, it is quite possible for debt as a percentage of GDP — and this is what matters, not absolute debt — to fall while running a deficit. This can happen through a mixture of growth and inflation. And it's not only possible, it is in fact exactly what has happened. Look at the first and second graphs in the link above: the huge post-war debt fell while the UK mostly ran deficits. In 54 out of the last 60 years, the UK public sector has been in deficit. Likewise, despite the UK's debt increasing both in absolute terms and as a percentage of GDP in recent years, more than doubling since the recession, the amount paid in debt interest has not increased. In fact, it has fallen: when debt was at its lowest, at around 30% of GDP, the interest we paid on it was higher than it is now with debt at 80% of GDP. The reason is that the effective interest rate we pay on public debt has fallen to a low. This seems counter-intuitive. If an individual gets themselves heavily into debt, the amount they can borrow becomes limited and the interest rates on offer go up. But the public debt of the UK is quite different to such private debt. The reason is that in troubled economics times, as we're still experiencing, UK bonds (shares in public debt) are trusted more than many other forms of investment. There is high demand for the UK's bonds from nervous investors and so their price goes up and this means their yields (akin to the interest rate) goes down. UK bonds are trusted because the UK has its own currency and a central bank. The same is true of the the US and Japan. This is why the UK is well equipped to deal with high debts and deficits that occur in times of economic crisis, and why countries in a flawed monetary union, such as Ireland, Greece or Italy, end up having their fiscal independence curtailed by the wishes of a large, wealthy state like Germany. There's little doubt Scotland would have been in deep fiscal trouble had it become independent in March 2016 and this gives the pro-union argument much credence. But it rests too heavily on the current economic situation, and fails to make the case for a key strength of the UK. The pro-independence case is correct in principle, in that deficits are historically the norm, and that they are reduced by growth, but it's unrealistic about timescales and seems to hope for the best and make no plan for the worst. Perhaps the UK's ability to deal with crises by handling large public debts and deficits can be built into a new case for an independent Scotland? That raises further questions. Technically, can a small country with trade dominated by a much larger neighbour launch its own currency and gain trust in its bonds without its own borrowing history? And, politically, would proponents of such an approach risk highlighting an existing strength of the UK? The thought experiment I've conducted in these blog posts is limited because the arguments are forced to sprout from one graph. But, both arguments and the commentary above are not based on only the data in that graph. To make an argument you have to bring in other information and, importantly, the weight you will give to various pieces of evidence will depend on your pre-existing views. Like it or not, we are all, myself very much included, susceptible to delusions of objectivity. In writing my book I was conscious of this problem. My aim was to let the data tell its own story and prevent my own views from polluting it. When reading blogs, articles and books I paid attention to how information gets slanted according to point of view. This helped me avoid some common pitfalls, and led to me to aim for a light touch with the commentary. Similarly, data was processed as little as possible in making tables and graphs and care taken in details such as the scale chosen for axes. There were also some difficult choices to be made in choosing what information to include and what to omit. But it's impossible to police yourself for bias so I also made sure drafts went to people with a variety of views for comment (there exists a spreadsheet which tracks comments against people's political leanings). I feel I've done the best I can in letting the data speak for itself in my book, but I'm very interested to know if I've fallen short of my goal. Any feedback on that, preferably constructive, is very welcome. In the first post in this series I introduced the graph below, in the second I presented a pro-independence argument based on it and now I'll give a pro-union one, again from the centre-ground of politics. I'm not aiming for balance here, and not suggesting both descriptions are equally valid or complete; my aim is to explore how the same data can be interpreted from two very different points of view. In the next post I'll highlight some flaws in both arguments. According to the Scottish Government's own GERS figures, independently assessed by the United Kingdom Statistics Authority, Scotland would be facing a £15 billion deficit if it had become independent in March 2016. As a percentage of GDP, the UK's deficit is 5%, but Scotland's is 10% of its GDP. An independent Scotland would have had the ignominious honour of having the largest deficit in the EU. And you can appreciate the full extent of the problem from this graph. 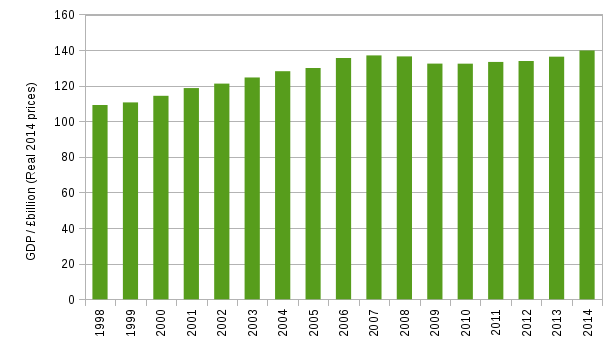 The gap between the top of each bar (including the white bit) and the green line is Scotland's deficit. The fact that the green line (spending) sits above the top of the bars (revenue), and well above it in recent years, tells us that Scotland is spending beyond its means. It can afford to do so because it is part of the UK. You may have heard North Sea revenue being called a "bonus", but is it? If you consider only onshore revenues by ignoring the white bits of each bar, then you'll see that the £15 billion deficit of 2014-15 is actually the smallest deficit post-2008, with the largest being an eye-watering £22 billion in 2009-10. So a bonus? No. Maybe a fiscal buoyancy aid during an economic storm, and not a reliable one at that: North Sea revenues have dropped from averaging £7.6 billion per year over the last decade to only £1.8 billion in 2014-15 and are expected to be smaller still in 2015-16. But none of this is a problem for Scotland because it is the UK that borrows to fund the deficit and this ensures the debt burden is distributed and does not fall on any one of its countries. The UK's debt is worryingly high right now — £1.6 trillion — and will continue growing along with the interest we pay on it while we run deficits. But the UK is well-equipped to deal with its deficit and although the crash in oil prices would have left a big hole in an independent Scotland's finances, it is much diluted in the UK's larger economy. The union is a ship that, if steered with care, can carry us safely through these stormy economic seas together. Yesterday's post about the deficit set out some facts with little interpretation, but for the next couple of posts I'm going to liberate myself from my usual style and attempt to present the same information from other points of view. In this one I become a pro-independence supporter who's somewhere in the centre ground of politics. Rest assured (or become restlessly disturbed) that I intend to play the part well and put forward the best argument I can construct. It's completely normal for a country to have a deficit. An independent Scotland would not be at all unusual for having one and most of our EU neighbours run deficits. But it is right to ask how we would deal with it. Let's look at the numbers. We shouldn't focus too much on any one year, and circumstances of the past are unlikely to be similar to those in years ahead, especially with independence. We're still in the wake of the worst crisis since the great depression so recent years are not typical. But there are clear examples in the past, like 2000-01, where you can see Scotland's revenue matching its spending. No one denies the North Sea bonus is absent for now, and it serves as a reminder that it is wise to diversify and foster growth in new sectors. The question concerning raising revenues to match spending is not an if, but a how. The way forward can be seen on the graph. Look at onshore revenue since 2009-10: it has grown in every year and risen by over £4 billion per year, or £12 billion over all those years. We have steady and uninterrupted growth despite our economy being restrained by Westminster austerity. With full control of Scotland's fiscal levers and our own policies to boost renewables and prioritise our export industries we can accelerate this growth and bring revenues up to meet spending in coming years. And to those who say the required growth cannot be achieved in a country like an independent Scotland, have a look at Ireland's real growth rate of 5.2% in 2014. Preliminary quarterly data for 2015 suggests higher growth still. Such a growth rate can close Scotland's deficit in five or six years. Remember, these are not my own views but my best efforts to put forward the arguments of an independence advocate. In the next post I'll keep the saltire aloft but wave the flag of the union too. The graph below shows the total revenue from taxes and other fees raised in Scotland. The amount from North Sea revenue is the geographical share attributed to Scotland, which is about 80% of the UK total. Public spending, or Total Managed Expenditure to be precise, is shown by the line. All figures are adjusted for inflation to be in 2014-15 prices. 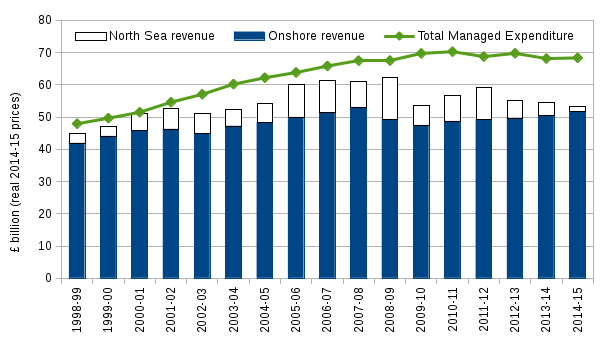 Revenue including the North Sea grew somewhat unevenly from £44.8 billion in 1998-99 to reach a peak of £62.1 billion in 2008-09. It dropped by £8.4 billion (14%) the following year and although there was a recovery for several years due to North Sea revenue increasing, total revenue suffered another drop in 2012-13 of £4.0 billion (7%) due to a sharp fall in North Sea revenue. The fall has continued so that by 2014-15 public revenues were at £53.4 billion, slightly below the low point of 2009-10. The picture if North Sea revenues are excluded is different. The growth in revenue is more gradual but less variable. Onshore revenue in 1998-99 was £42.0 billion and it increased to a peak of £53.0 billion a year earlier than the total revenue peak in 2007-08. It then suffers a smaller drop of £5.5 billion (10%) but spread over two years. From 2009-10 onwards, onshore revenue grew with an average annual rate of 1.5% to reach £51.6 billion in 2014-15 which is well above the 2009-10 low but still short of the 2007-08 peak. Public spending was larger than revenue in every year shown in the graph, but the gap has been larger since the financial crisis of 2008. From 1998-99 to 2006-07, spending grew by 37% and so did total revenue, whereas onshore revenue grew by 23%. In contrast, the growth in spending measured from 1998-99 to 2014-15 was 43% whereas for total revenue it was only 23%, and 19% for onshore revenue. Scotland's deficit is its spending of £68.4 billion less its revenues of £53.4 billion which comes to £15 billion (technically this is the net fiscal balance which is not quite the same thing, but the difference is not worth bothering with for our purposes). To compare deficits, it's usual to express them as a percentage of GDP. Scotland's deficit is about 10% of its GDP whereas the UK's deficit, which includes Scotland's, is 5% of its GDP. The UK's deficit is one of the largest in the European Union and Scotland's would be the largest except for one vital fact: Scotland doesn't have a deficit. Scotland's deficit is in fact notional because it doesn't have to balance its spending against the revenues raised in Scotland. Instead, this balance is done at the UK level and so it is only the UK's overall deficit that has practical implications. I try to make these posts relevant to something I've seen in the news in the last few days, but it's been rather quiet this weekend. Perhaps all the politicians are too busy with their great responses on the doorsteps. The graph below shows the average daily prison population. It is calculated by adding up the number of people in prison on each day of a year and dividing by the number of days in the year. The data stops in 2011-12. I re-checked the source spreadsheet and found it was updated on 31 March 2016, but it still doesn't contain newer data. I'm not sure why this is. Look first at the columns — these use the scale on the left. The prison population rose from 6100 to 8200 or 35% over these years. Most have a sentence of less than 4 years, with a slightly smaller number being in prison for 4 years or more (including life prisoners and those recalled to custody). A smaller number of prisoners are on remand, that is, in custody awaiting court proceedings. 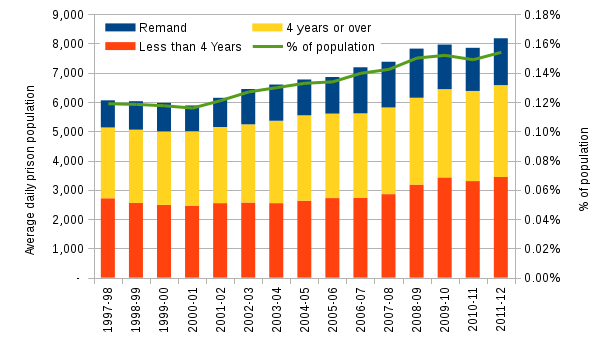 The prison population rose from 0.12% of the population in 1997-8 to 0.15% in 2011-12. Or, in other words, 12 out of every 10,000 people were in prison in 1997-8, rising to 15 in 2011-12. Although this is a small percentage, the 35% growth of prisoner numbers over this time is significantly larger than the 4.3% growth in the population. In contrast to the rise in prison population, the number of crimes recorded by police in Scotland has been falling quite dramatically. From 2005-06 to 2011-12, it fell by 25%. and to 2014-15 by 39%. This trend is not unique to Scotland, but is seen across the UK, and in many other developed countries. No one is sure what the explanation for it is, but one theory that's got my attention, though I'm not yet convinced by it, is the removal of lead in petrol. The other day it was announced that Scotland's electricity generation from renewable sources increased by 15% last year. This is in line with the trend of the last fifteen years, which is discussed in Chapter 2 of the book. On a dreich day in the early 1990s, I stepped off a train at Falls of Cruachan train station just above the banks of Loch Awe. Back then, and perhaps still, it was a summer-only request stop and you had to thumb a train down for it to stop. The start of the trail up to Ben Cruachan was shrouded in bracken which emitted the occasional surprised sheep. It was rather an unpleasant trudge and the atmosphere was close. But, after climbing a couple of hundred metres, I was astonished when I looked up from the muddy path. For a moment I saw an Aztec temple. I was looking at the impressive dam that holds back the waters of the reservoir that feeds Cruachan power station. To continue my ascent of Ben Cruachan I had to climb a ladder up the wall of the dam. Magic. When I returned home I mentioned the adventure to my elderly neighbour. "When I was last there I said it'd be a cracking spot for a dam," he said. He reckoned that was back in the early 1950s. Cruachan doesn't actually generate electricity from scratch. It's a pumped storage station. 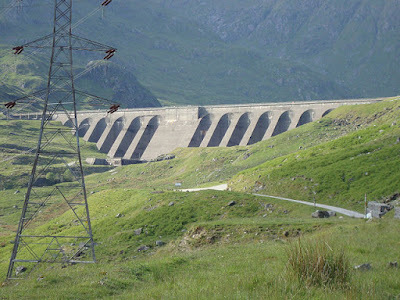 At times of low demand it uses excess electricity on the grid to pump water up into the reservoir and then, when we're all making cups of tea after watching royals kiss or a penalty shoot-out in the World Cup, Cruachan and other pumped storage stations can collectively zoom from nought to a couple of giga-watts (GW) in a minute or so. 2 GW can boil a million kettles, power many million TVs, or power the flux capacitor in Back to the Future's Delorean for time travel. In addition to pumped storage, Scotland also has many hydroelectric stations to generate electricity from scratch using water collected in highland reservoirs. The graph below shows that in 2000, a few years after I climbed Cruachan, almost all renewable electricity generation was hydroelectric (pumped storage is not included on this graph). Look what happened at the start of the 21st century. 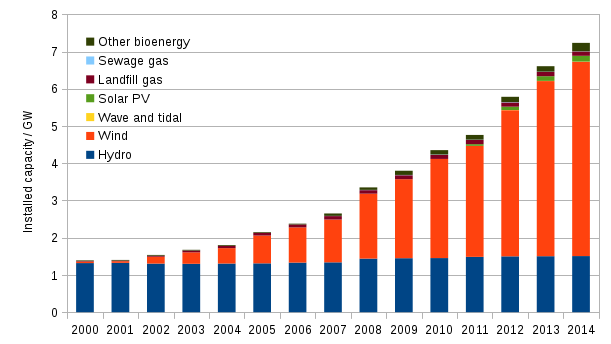 Renewable electricity generation rose exponentially. And I mean literally, in the mathematical sense of the exponent function, not just the figure of speech. The dramatic increase is almost entirely due to wind generation which has risen one-hundred fold over the last fifteen years. There is of course a debate to be had about whether people want to see more wind turbines on the landscape, and another on how best to secure our electricity supply. I won't get into those issues here, but I do think the turn to renewables is essential in reducing the fossil fuel emissions that cause climate change. That said, it's important to realise that renewable electricity generation is only one part of the emissions problem, and actually a minor part. Of all our energy use in Scotland, only 21% is electricity, with the rest being dominated by fossil fuel burning: 25% is for transport and the largest is for heat at 54%. 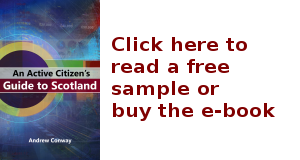 There is a new dimension to the political debate ahead of the 2016 Scottish Parliament election — tax. In this post I draw on material from Chapter 5 of the book to explain the changes in devolved tax and spending powers. The powers of the Scottish Parliament were originally set out in the Scotland Act 1998, then extended by the Scotland Act 2012 following the findings of the Calman Commission. The Smith Commission recommended further powers following the 2014 independence referendum and these came in the Scotland Act 2016. A summary of how much of public revenue and expenditure is devolved is shown below. The precise figures shown here are specific to the year 2013-14 and although they will vary from year to year the changes are likely to be no more than a few percentage points. Since devolution began in 1998, about 60% of spending in Scotland has been controlled by the Scottish and local governments. No new spending powers came with the Scotland Act 2012 but the Scotland Act 2016 devolved Universal Credit and some other welfare payments. Spending powers reserved to the UK are mainly for welfare and defence. Revenue raising powers covered less than 10% initially, but under the Scotland Act 2016 this rises to over 40%. I'll focus on the income tax powers here because they make up most of the devolved total and have provoked the most political debate. The main power in the Scotland Act 1998 was to raise or lower the income tax rate by up to 3p in the pound (or 3 percentage points) from the UK rate. This power was never used. The Scotland Act 2012 went further and introduced the Scottish Rate of Income Tax (SRIT) which came into effect as of today, 1 April 2016. In this, the rate of income tax is reduced by 10p (or 10 percentage points) in Scotland, and the Scottish Parliament is tasked with setting its own rate to replace it. Any decision to change it would affect all other rates by the same amount , e.g. an increase to 11p would bump the 40p rate up to 41p. The decision for 2016-17 was to set it at 10p to match existing rates in the rest of the UK. The Scotland Act 2016 gave the Scottish Parliament control over all rates and thresholds for income tax (making SRIT obsolete), although it cannot reduce the personal allowance below which an individual pays no tax. The Scotland Act 2016 also assigned the first 10 percentage points of VAT raised in Scotland as Scottish revenue. With the VAT rate at 20%, this represents half of all VAT raised in Scotland. The word 'assigned' is used here rather than 'devolved' because European Union rules prevent VAT rates from varying within a member state such as the UK. These new powers will give the Scottish Government access to more fiscal levers. The fiscal lever is a dubious analogy for decision-making on tax and spending. For example, there is a lever which controls the basic rate of tax, and currently it's set at the 20% notch (or at the +10% SRIT notch to be strictly accurate). The reason I use the word "dubious" is that the analogy suggests we know what moving a particular lever will do. I like to think of an old-fashioned signal box in which you can pull a lever to change points on a railway track and raise a signal instructing a train to stop. But any economist will tell you that fiscal levers are not like that. Pulling a fiscal lever may have the desired effect, or it may do nothing or it may do the opposite of what's expected. Take the proposal to raise the additional tax rate of 45% on earnings above £150,000 to 50%. This may well raise some revenue, but wealthy people and their talented accountants may find ways to avoid it, possibly by moving out of Scotland. So it's hard to say how much revenue would be raised. For such reasons, politicians tend to be wary of moving fiscal levers especially when there are other targets they've set themselves, and even more so if a tax rise is needed and an election looms. A confident yank at a lever may have unforeseen consequences that might upset voters and the economy. So am I saying that these weird levers are of no use and we should be content to trundle along voting for parties who suggest only slightly different ways of fondling fiscal lever handles? Not at all. I think politicians should be bold with them when society's needs require it. Consider the embryonic welfare state in 1911 for which a small but innovative fiscal lever called national insurance was invented. In 1948 it was much upgraded so as to expand welfare provision and create the NHS, and at a time when public sector debt levels as a percentage of GDP were much higher than at present. And to return to devolution, the key point is to consider which levels of government should control different fiscal levers. For income, there are good arguments for them operating at the country level, and perhaps even at the council level too, though there is the tricky issue of not exacerbating regional inequalities. For wealth, which shows much greater inequality overall, mainly because it is negligibly taxed in comparison to income, this needs co-ordination at the European level or even globally. If you'd like to see a thorough, evidenced-based argument for this, then I recommend reading Thomas Piketty's book Capital in the Twenty-first Century.